SCRIPT UPDATED 15th April 2011! 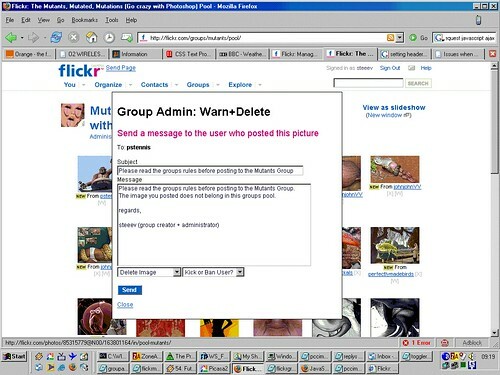 I wrote a GreaseMonkey script for Flickr called "Group Pool Admin: Warn + Delete"
It lets a group administrators and moderators more easily remove inappropriate images from a group's pool, lets you easily send a warning message to the user who posted the image to the pool and also lets you kick or ban the user all in one simple interface. * Save messages as reusable templates. they will automatically be substituted with the appropriate values when you send the message. DONATE! If you appreciate my scripts and would like to thank me for them, please consider making a donation. My paypal link is available on my website and also on my profile page.